The third Jack Ryan thriller following The Hunt for Red October (1990) and Patriot Games (1992), Clear and Present Danger (1994) is a bit more ambitious than its immediate predecessor but ultimately slightly worse thanks to some seriously muddled storytelling, ham-fisted moralizing, broad caricatures of drug lords and especially corrupt government officials, and a badly miscast lead. You know you're in trouble when the studio resorts to quoting Sixty Second Preview's Jeff Craig, the notorious blurbmeister who doesn't even see most of the movies he reliably gushes over. An American businessman with close personal ties to the U.S. President (Donald Moffat, previously Lyndon Johnson in The Right Stuff) is murdered execution-style along with the rest of his family. Initial reports suggest pirates merely wanting to steal his yacht, but CIA analyst Jack Ryan (again played by Harrison Ford) determines the American was in fact laundering money for a Columbian drug lord and caught with his hand in the cookie jar to the tune of $600 million. 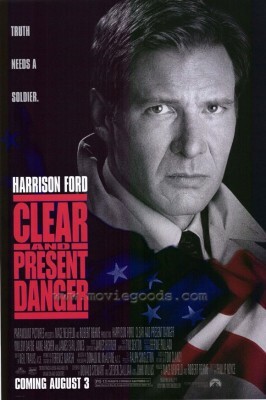 A big part of Clear and Present Danger's problem, frankly, is Harrison Ford. His range seems limited to two types of characters: A) the slightly cocky, sardonic adventurer (Han Solo, Indiana Jones); or B) the generic family man under duress and extraordinary circumstances (The Fugitive, Frantic). When he's tried other kinds of roles (Regarding Henry, Hollywood Homicide) with a few notable exceptions he's tended to deliver miserably bad performances, though it may have as much to do with the bad scripts offered him as Ford's abilities as an actor. Patriot Games worked in Ford's favor; it was yet another family-in-peril story - in other words: "B." Clear and Present Danger is a different story. Several times Ford's character is disparagingly referred to as a "boy scout," and throughout the picture Ryan exhibits extreme naiveté (Corrupt politicians? In Washington? I don't believe it!) and for most of the film Ryan is almost doddering. Until the climax he's four or five steps behind the bad guys while around his own colleagues and superiors Ford mumbles and squirms with inexperience. This wouldn't have been attractive had Alec Baldwin (who played Ryan in The Hunt for Red October) been the lead, but for 52-year-old (at the time) Ford to behave like such a neophyte only makes him appear obscenely unobservant. Not good considering that observing is supposed to be his job. Corrupt Washington insiders have become a tired cliché (James Cromwell seems to have cornered the market playing such characters since John P. Ryan went into retirement). Czerny and Yulin are instantly recognizable villains; they're like fifth columnists in those hysterical anticommunist movies of the '50s. Thin-lipped humorless types with flaring nostrils, they seem to enjoy delivering long monologues while staring unblinkingly at nothing in particular. In the novel conservative author Tom Clancy made them much more sympathetic; here's it's not even entirely clear why these guys are launching this potentially disastrous private war, other than to improve the president's approval rating prior to the next election. There are smart thrillers that are complex and challenging, and ones like this that are pointlessly confusing and muddled. It's long (142 minutes) and moves like molasses. Though it alludes to the same complex ethical issues raised with Iran-Contra, the derivative climax is straight out of Rambo: First Blood Part II, and nearly as dopey and flag-waving. Other aspects of the film are almost embarrassingly bad. As in The Hunt for Red October, non-English speaking characters are introduced speaking their native language and then, using a cinematic device (in this case, involving the use of double-printed frames), the dialogue switches to English mid-sentence, implying they're still speaking the foreign language but the audience gets to "hear" it in English. Though it wasn't the first film to use the technique, in The Hunt for Red October the effect is exciting and effective; here it just seems flashy and dumb, especially since the language in this case is ordinary Spanish, not exactly the mysterious tongue of Aramaic. I really don't understand all this excessive DNR and other over-processing; didn't somebody QC this on a big screen TV before it was approved? Did anyone really think this looked good? While certain shots in the 1080p 2.35:1 show (filmed in Panavision and processed by Deluxe) look great, the DNR frequently makes backgrounds look less real and more artificial, like the actors were standing in front of slides projected onto sandstone. It also tends to flatten out the image, giving some shots a pushed two-dimensional quality that adds to the unreality of it all. Another problem with all this unneeded over-processing is that, in trying to keep everything super-sharp, it actually tends to make the film's quick pans, hand-held shots and the like look worse rather than better because in trying to keep everything looking good the processing adds a strange jerkiness to motion. Originally released in standard Dolby Digital Stereo, the Blu-ray offers a remixed 5.1 Dolby Digital TrueHD track which is pretty good though not nearly as strong or interesting as Red October's. Also included are 5.1 Dolby Digital stereo tracks in French and Spanish, along with subtitles in all three languages plus Portuguese. A trailer for the film is likewise presented here in 1080p high-definition, though the only other extra is a carryover from a previous release: a behind-the-scenes documentary called Behind the Danger, in 16:9 standard-def and with the same cast of characters, pretty much, as the Patriot Games featurette. As with Patriot Games, Paramount's Blu-ray of Clear and Present Danger is a disappointment, an inadequate transfer of a disappointing thriller. The film has it fans, but because of the DNR issues you'll want to Rent It first.